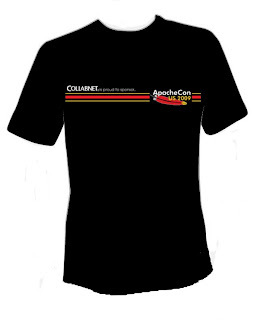 Today during the opening ceremonies of the U.S. ApacheCon 2009 conference, Hyrum Wright (President of the Subversion Corporation) and Brian Behlendorf (a representative of both Apache and CollabNet's Board of Directors) made a joint announcement that the Subversion project was immediately seeking acceptance in the incubation process at the Apache Software Foundation. It's not the cleanest thing I've ever done graphically. I really, really like the striped front. But I was tasked with conveying an awful lot of information (the 10-year anniversary of the ASF, Subversion's fit into the mix of other Apache projects, CollabNet's history as founder and primary corporate sponsor of the project, and so on), and the resulting busy-ness of the back's design unfortunately conveys that fact. Still, not too shabby for short-deadline (like, three days) work.